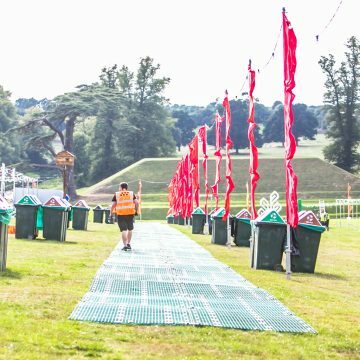 Pre-festival stewards will be required to arrive on site as early as Monday 19th August. Pre-festival stewards provide a welcoming presence for those who are authorised to arrive on site before the festival, as well as checking vehicle permits and wristbands for those permitted to have early access. They have a role in guiding cars, caravans and campers from this group into the correct places so that the other festival volunteer teams can start their roles smoothly and easily. As other teams arrive and start to get set up, there will be a fair amount of close working and communication required with a variety of other festival teams. You may be able to steward on pre festival team and volunteer for another team during the festival for the weekend as long as the jobs do not conflict. This will decided on an individual basis. Pre-festival Stewards need to be polite, friendly and outgoing, good at communicating clearly and able to be assertive if necessary. Stewards are often the first people that the festivalgoers and other volunteers will meet when they arrive at Greenbelt, so this is a very important role. You will need to be available from Tuesday 21st until Friday 24th August. Pre-festival stewards are permitted on site from the Monday before the festival, so please do not try to turn up earlier. Also, remember that any others in your group who are not volunteers will be restricted to stay in the campsite until the start of the festival on Friday. Access to other areas of the festival site will not be permitted. On arrival, we will need to know names and numbers so that correct passes can be issued if needed. If you have any questions, please e-mail the stewarding address. The sessions will take part on the Tuesday. They will include important information about the emergency services on site.